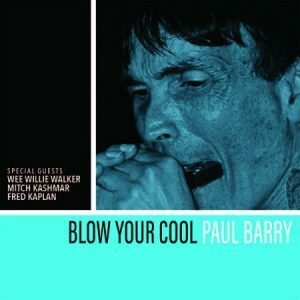 Minneapolis, Minnesota based harmonica player-singer Paul Barry, a protégé of the late harmonica monster William Clarke, delivers this his second CD release. It’s quite clear from this release that he ranks up there in the higher echelons of the current crop of harp players. Add to that the fact that he surrounds himself with a first rate set of musicians. Included here are Mitch Kashmar, Fred Kaplan, Wee Willie Walker and Jeremy Johnson. Jeremy is a new name to me, but he is a gifted tradition based blues guitarist. The CD is divided evenly between band originals and covers. The instrumental “Hawaiian Eye” leads things off and features Mitch Kashmar on harmonica along with Paul. 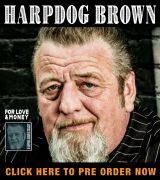 It’s a thoroughly enjoyable harmonica based romp. Tim Wick’s organ and Jeremy Johnson’s guitar are also highlights on this tune. Wee Willie Walker makes his first vocal appearance on “What Did I Do So Wrong” and a fine one it is. He possesses the perfect soulful blues voice. Paul and Mitch pay homage to their mentor William Clarke on “Tribute To William Clarke”. It’s a fine performance and the longest here, clocking in and just over seven minutes. With my limited exposure to Clarke I associate him more with the over blowing technique which there is none of on this track. Fred Kaplan accompanies with his piano skills. Paul handles the vocal on “You Can’t Beat The Horses”. His voice is passable. Max Ray contributes some tasty sax, while Tim wicks supplies the piano. Wee Willie Walker delivers the goods on Smokey smother’s “Drinking Muddy Waters”. As usual Jeremy Johnson shines on guitar. Willie also does another splendid turn on Willie Dixon’s “Spoonful”, a song done by Howlin’ Wolf, but many rock fans are more familiar with Cream’s raucous take on it. Paul’s harp is spot on here as well as throughout the proceedings. Paul steps up to the mic for the second time on Sonny Boy Williamson I’s “You Got To Step Back” backed only by his harp, Fred Kaplan on piano and Jeremy on guitar. Tim Wick displays his organ technique along side Willie’s vocal and Max Ray’s sax on “More Than I Can Give”. The slow blues instrumental “Low-Down” is just Paul on harmonica along with Jeremy’s guitar. A full band instrumental brings things to a close. The title track again has Mitch on second harmonica. It’s an upbeat groove fest. A totally enjoyable ensemble blues recording were all involved get a chance to shine displaying their musical skills. The sound they attain in stylistically pretty traditional while coming across as fresh and vibrant. 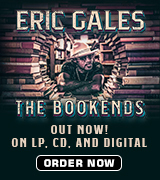 Real blues is out there as evidenced by this fine recording. Sometimes you just have to search it out.